Letters / Who Wore It Better?
. . . Olive! This is her happy face. No, really. It fits like a dream. Julia says she had tricked me into giving her Olive’s measurements. I have no recollection, but of course I wouldn’t consider it odd that someone would be curious about Olive’s figure. Action shot, highlighting the practical heinie-flap, with tidy applied i-cord trim. The yarn: Berroco’s Ultra wool, which is washable. This little sweater has a history. 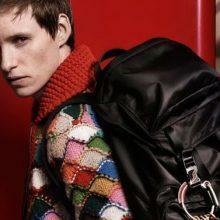 For the story of the quest by Julia and other designers to reverse-engineer the shell motif from a Prada sweater modeled by Eddie Redmayne, start here and also go here. 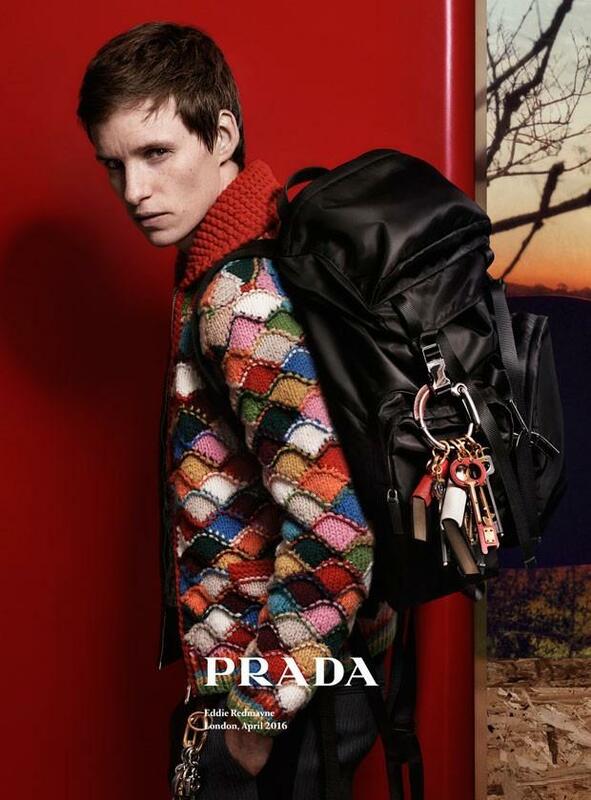 This is Eddie Redmayne’s happy face. No, really. And ultimately, Olive’s amazing new sweater, in which the Prada short-row shell motif has found its highest and best use. 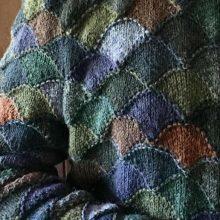 For any knitters who are thinking of attempting a Pawada Sweater (see what I did there? 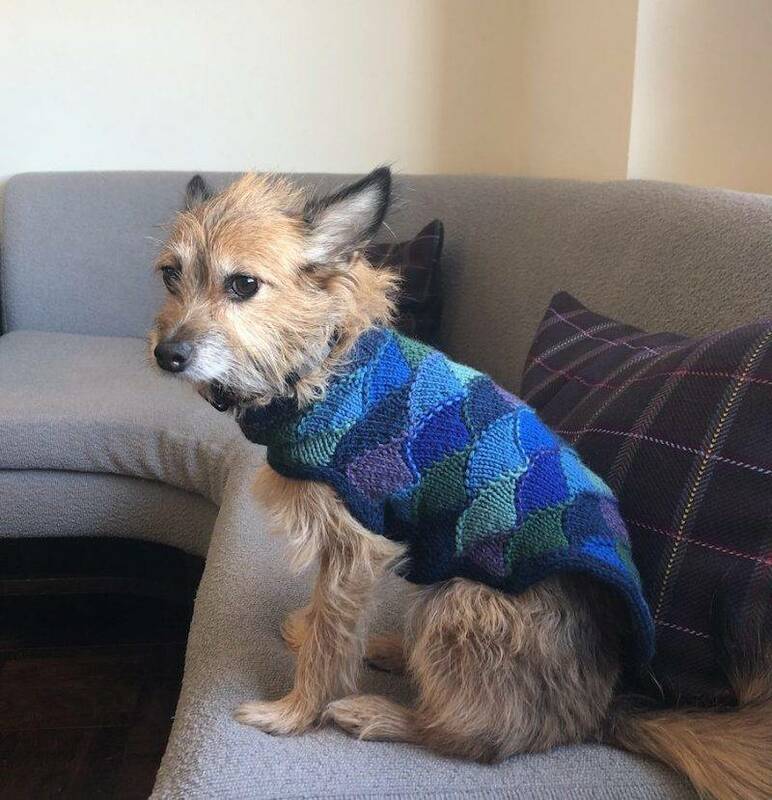 I blame Cristina Shiffman) for their own pet, I highly recommend Julia’s blog post, “How to Wing an Eddy Dog Sweater.” The engineering involved in this little garment is impressive. 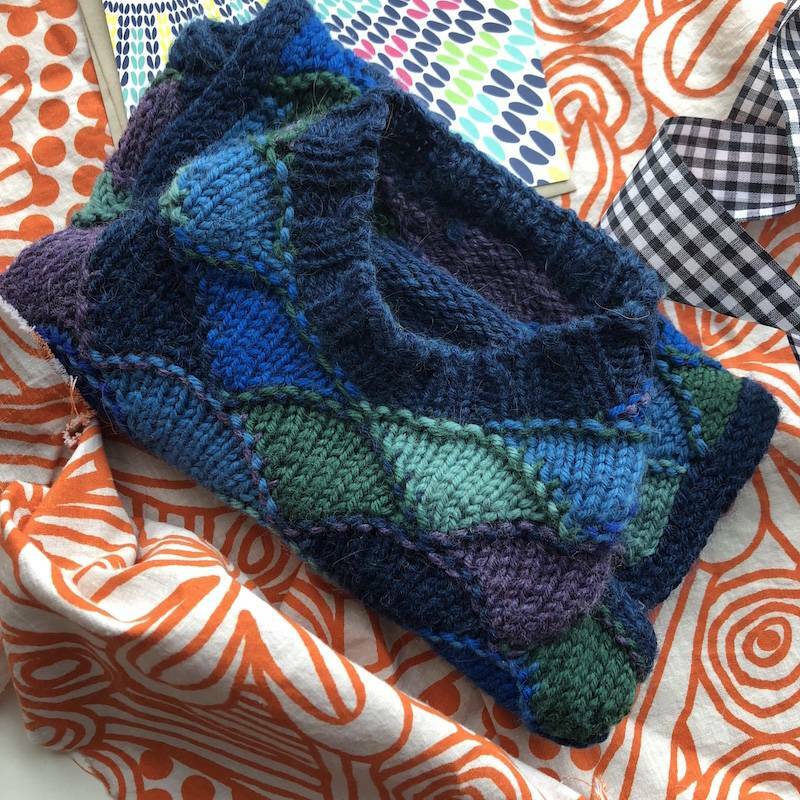 While you’re over at Julia’s, “Listen to the Voices You Can’t Hear,” her post on diversity in the knitting world, is a thought-provoking read on an important issue in our community. Thank you, Julia, this incredible gift made my day, week, and beyond. In a city full of pup boutiques, I have the best-dressed dog right here. 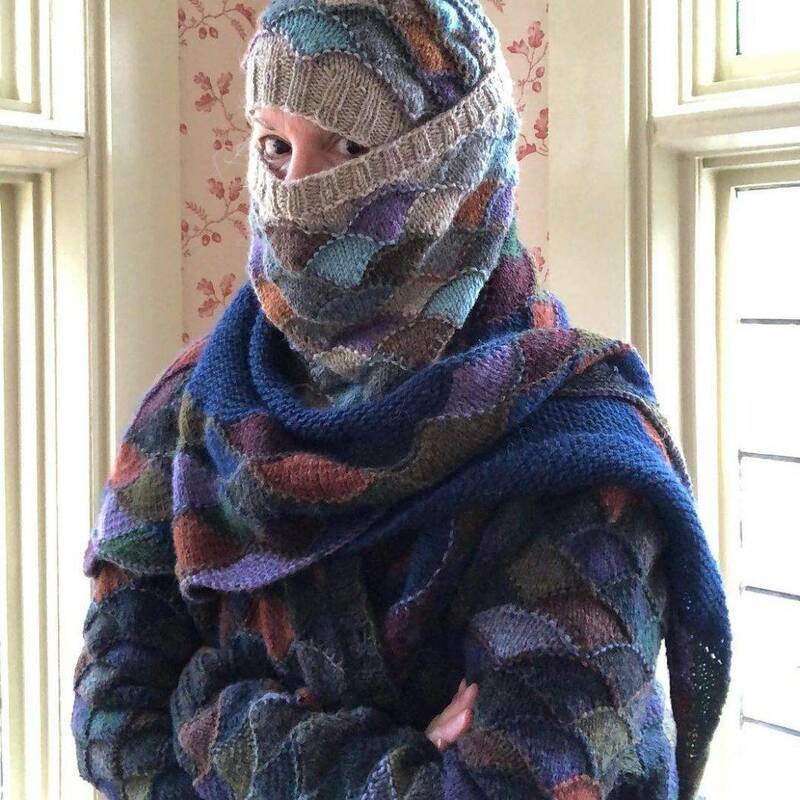 Knitting can take you to some interesting places. Paws down, Olive wears it better than Eddie. No offense, Eddie! OMG. 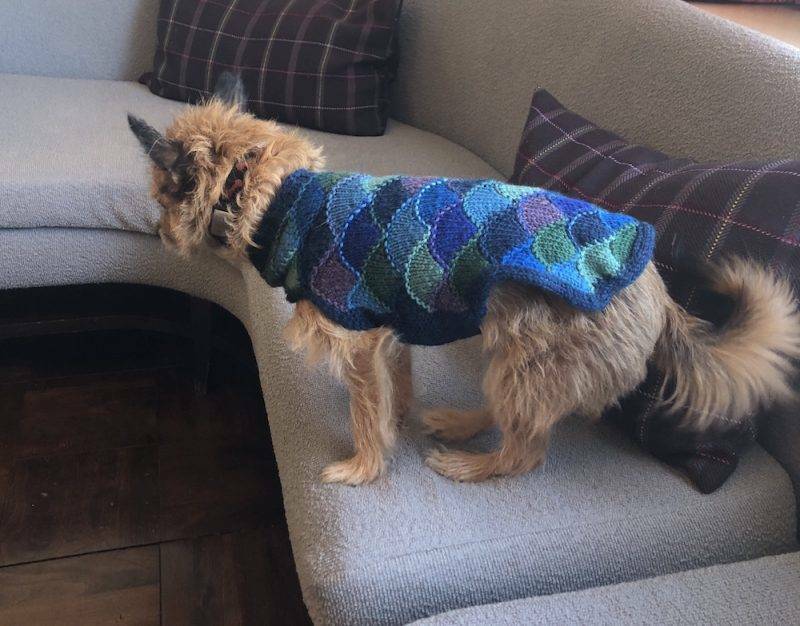 I can’t believe I spent weeks knitting an Eddy Wrap for my (beloved) dog-averse sister when I could have been making the equivalent for my dog! I know a dog who needs this! Well, now Cher and Jellybean May need this sweater too! Yes, they most definitely do! They’d look fabulous! Eddie wears it. Olive owns it!! Oye! My phone screen has a big crack which makes typing on it a daily adventure. Add in auto correct and that explains spelling my name wrong! You have the nicest knit friends Olive!!! Who wore it better? Definitely Olive! Oh Olive! How lovely you look. Poor, poor Eddie! Olive looks wonderful! I love it. oh my gosh! Olive looks absolutely stunning in her beautiful sweater! 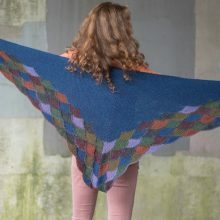 I have spent hours drooling over the variations of that pattern that you have posted – it’s not sane on my part. Love this. 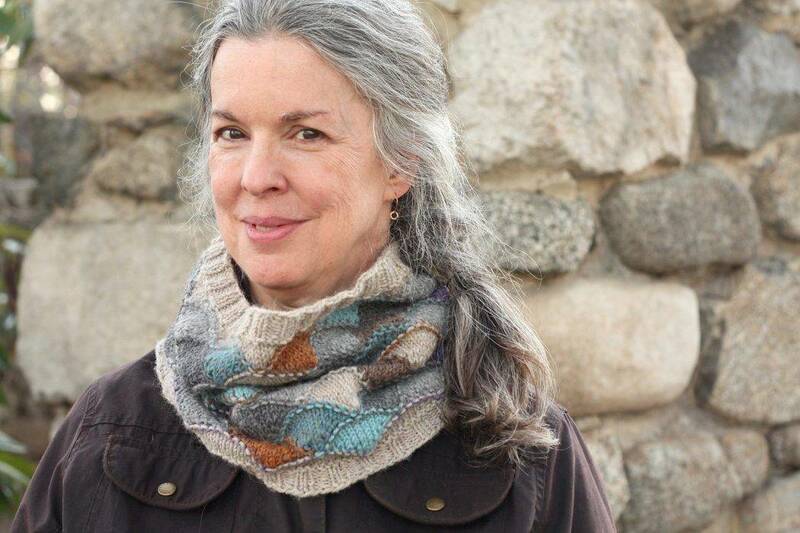 And thank you for reminding me of the Eddy Hap and Cowl (I bought the pattern just now). 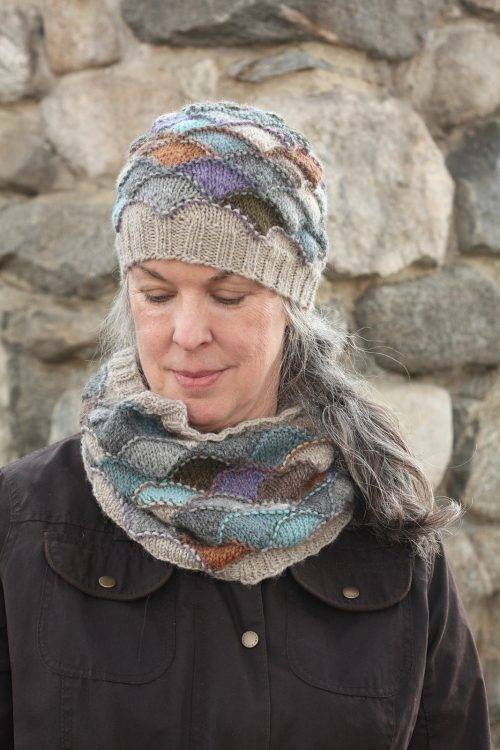 I bought the Eddy Wrap pattern just to learn how to knit the shells (I am not a shawl-wearing girl), but the hat – yes, that is the ticket. Once I become proficient in shells, there is this mini schnauzer that my sons’ family has adopted….. I know but a hap would also be great! Such sweetness and kindness in an obvious labor of love. Olive is rocking the look, too. 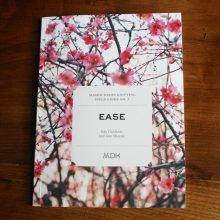 Although I have the yarn for the Eddy Wrap, I haven’t had enough time start another project. Being a 65 year old former RN, currently on disability after a fall, my dedication to a course that will bring me out of abject poverty is my first priority. Going from being a “doctors wife “ to being divorced and then living on disability has been a tough transition. But vocational rehab has saved my life by funding a medical coding course. My light at the end of a tunnel ! 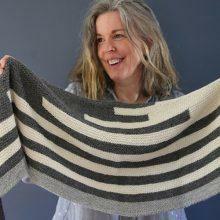 My knitting also keeps me focused and I look forward to your daily posts. Ann, take care. I work on healthcare workers’ occupational safety and health and know that you have been through a lot. I am glad that you have found the coding course and I hope your new career will use your experience. I am sure people at the bedside are missing your expertise. Way to go Olive! Perfect colors, too. Please don’t tell Bailey. He still has zero bespoke sweaters after 8 years!! I’ve tricked someone to giving me her kitchen colors to make towels & dish rags, but getting dog measurements is a whole ‘nother level. Olive absolutely rocks it. As someone searching for a better dog sweater, I love the design and features of this one, especially the heinie flap and the chest bridge. Wow! Wow, a custom knit JFC sweater? That’s one lucky pupperoni & I’m jealous. Olive is the perfect model. She looks good in everything.I also think her color combo is better than the Prada. Olive definitely wears it best! Strut proud Olive! Definitely looks best on Olive. That’s a gorgeous sweater and Olive is one lucky girl! She’ll be the envy of all the other supermodels. Let the Devil wear Prada…Olive’s got a Farwell-Clay! Definitely a tie between Olive and Julia. Just now had the chance to go back to her post, “Listen to the Voices You Can’t Hear”. Such an important topic. When I go to my lovely LYS and to an occasional knitters’ paradise (Rhinebeck! ), and when I scroll through the gorgeous online and paper knitting mags and blogs, I mostly see only people who look like me: white women with enough money and time to spend on what can be a pretty expensive hobby. I hope I will always strive (and succeed) at listening to the voices I can’t hear. I live in a pretty non-diverse part of the country, and I sometimes feel down about knitting in public groups as they are so non-diverse. I do hope the knitting community continues to expand its diversity and grows as a welcoming place for all. 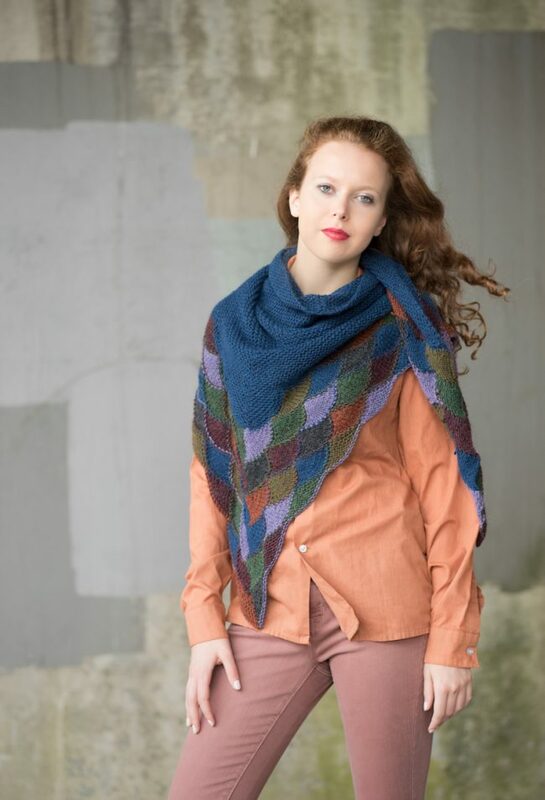 Oh my gawsh I love it – and the colors are perfect for Olive! Julia Farwell Clay rocks! Stylist to the stars. You and Olive and Julia are a delight. I love this so much! Olive and the sweater are both beautiful! 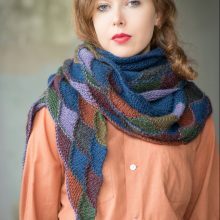 I love the shell motif, and considered it for a shawl a few years ago. This post has re-ignited my passion, (thank you!) though this time the cowl is calling to me. Thanks for this today! I needed it! Olive, paws down, wears it best! Don’t dare show the lovely Olive & her gorgeous sweater to my Paddy. He’ll want one, too, & then he’ll want to go meet her so they can show them off together. Forget Eddie Redmayne, grrrrlfriend, I’ll take you to the Boardwalk in Ocean City. Lovely. I ran into Julia at Rhinebeck, while she was talking to a man in another version of the sweater (primary colors). Of course I didn’t realize it was Julia until much later. OOPS. But I did tell her I loved her sweater, so I guess that’s what really matters. Olive really is the best-dressed dog, perhaps ever in the history of the world.